In 2004 the introduction of the Light Sport Aircraft (LSA) category opened new opportunities for the aviation community. Limited to two seats and a maximum speed of 120 knots, light sport aircraft do not require a medical, making it the perfect solution for aging pilots. The lighter aircraft also promised an inexpensive opportunity for students to make their aviation dreams come true with a minimum flight time of only 20 hours to become certified. Quite a few vintage aircraft meet the conditions required under this new category, such as Piper Cubs and Aeronca Champs but many aircraft manufacturers jumped at the opportunity to market new state-of-the-art sport aircraft featuring modern avionics and complete aircraft parachutes. New aircraft emerged in both the standard and experimental LSA categories to include Flight Design, Remos, and RANS. Aviation Insurance Resources (AIR) was one of the first aviation insurance brokers to work closely with industry underwriters and sort through what was needed to properly insure light sport category aircraft. Initially, insurance rates were a concern as newly manufactured sport aircraft had higher hull values and many are built of lighter, composite material. In addition, the availability of spare parts in the case of a claim on a European built LSA was a concern. Today, the insurance process is practically seamless for LSAs. AIR offers insurance solutions for homebuilt ELSAs during the construction process, for restoring vintage LSA qualifying aircraft, and insurance for renting or owning light sport aircraft. Time flies, and the light sport category is now well over a decade old and continues to grow. AIR understands the budgeting needs of aircraft owners and aviation business operators, because they are pilots, too! Serving fellow pilots for over 18 years, AIR shops all the aviation insurance markets to obtain the best rate and broadest policy coverages. To obtain a light sport aircraft insurance quote call 301-682-6200 or visit www.AIR-PROS.com to complete a quote request today! Time and time again, Aviation Insurance Resources (AIR) spots something familiar in competitors’ ads. Our slogans, premium comparison marketing campaigns, and even our company name have been replicated in print. These copycat trends continue to prove one fact: AIR is the aviation insurance broker to watch. After 17 years with direct aviation insurance writer, Avemco, Jon Harden founded AIR in 1999. Based on a foundation of providing service with integrity for pilots, by pilots; AIR was and always will be comprised of agents that intimately know the aviation industry. Every agent at AIR is a pilot and many have owned their own aircraft. Jon Harden – the founder of AIR is a Certified Instrument Flight Instructor (CFII) and currently owns a Pitts S1 and a Cessna 180. Last summer his daughter became a pilot as well. Chris Wolbert – an Embry Riddle graduate, Chris is a commercial and multi engine rated pilot. He’s been flying since 1990 and is one of the founders of AIR. Gregg Ellsworth – has been a private pilot since the 70s. He is also an Embry Riddle graduate with an aviation management degree. Jon Shimer – an A&P and private pilot with instrument and multi engine ratings, Jon has flown over 65 different models of aircraft. He has owned a Pitts Special and a J-3 Cub. He also performs with the Alabama Boys airshow act. John Sweeney – learned to fly at Winged Spartans Flying Club of Michigan State University in 1969 and is a CFI. He has 37 years of experience in the aviation insurance industry and his first insurance job was as an aviation claims adjuster. Victoria Neuville – an instrument rated commercial pilot, Victoria’s spare time is also centered around aviation. She can be found promoting her children’s book series, Turbo the Flying Dog and co-hosting the Stuck Mic AvCast aviation podcast. Patrick Smith – Patrick is AIR’s only lighter-than-air pilot and commercial CFII. When the sun rises and sets, Patrick is busy flying with his hot air balloon business, Tailwinds Over Frederick. Joe Ruck – firefighter turned pilot, Joe is also a CFI. He looks forward to being able to sign off his three great nephews and two grandsons for their first solos one day. Joe Cacho – a private pilot, Joe joined the original members of the AIR team in 1999. He is also an Embry Riddle graduate and favorite place to fly is in the Florida Keys. Bill Snead – the newest agent at AIR is not by any means new to the business. With over 35 years of aviation insurance experience, Bill is a commercial pilot and flies gliders. As you can see in each short biography above, every pilot at AIR brings unique aviation experience to the table. This group of aviation insurance agents simply cannot be replicated. The next time you see an aviation insurance ad, think twice if it is unique, or simply mimicking something greater. Serving our fellow pilots for over 18 years, AIR understands the budgeting needs of aircraft owners and aviation business operators. We shop all the major aviation insurance markets to provide the broadest coverage at the lowest rates. Call Aviation Insurance Resources (AIR) at 301-682-6200 or complete an online quote request to start saving today! 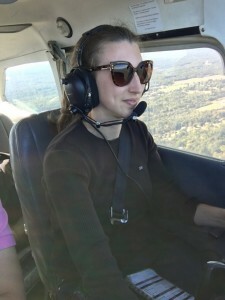 Over the summer, Aviation Insurance Resources (AIR) awarded their annual Get into the AIR scholarships to two inspiring female pilots. Today, we are checking in with Chelsea Dorman. C helsea is currently the program coordinator at the College Park Aviation Museum. She guides young aviators daily on tours and activities all about aviation at the oldest continuously operating airport in the world. Now, she finally is taking to the skies herself. Thanks to the Get into the AIR Scholarship, Chelsea has started lessons out of Potomac Airfield in Friendly, MD. With the skyline of Washington D.C. in the distance and the traffic from National above her, Chelsea’s lessons have focused on the importance of awareness of the airspace around her. 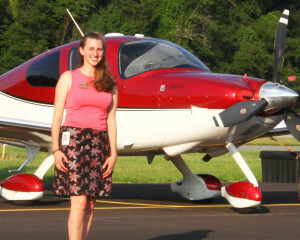 Her flight instructor is a friend which makes for a comfortable and fun learning environment. Chelsea says that her taxiing still takes some work, however, is getting more confident in the air after each lesson. “There’s so much to cover, but I feel like I’m making good headway,” she explained. Since 1999, AIR has remained closely connected to the industry they serve, many of their customers are friends and some are even family. This is because all the agents at AIR are pilots and understand the needs and challenges in owning or renting an aircraft and aviation related businesses. No matter your involvement in aviation, AIR can provide a comprehensive yet economical solution for your needs. For updates on future scholarships or an aircraft insurance quote call 877-247-7767 or fill out a quote request online today! A simple internet search will lead to a plethora of websites ready to compare rates from vacations to hotels and insurance. Almost anyone can easily identify Flo from Progressive Insurance, that cheery face advertising the one-stop insurance shop for auto and home insurance. Today, it has never been easier to compare and ensure you are getting the best bang for your buck…and that includes aircraft insurance! The cheery faces at Aviation Insurance Resources (AIR) may be a bit different from Flo’s. You may see them with windblown hair following an open cockpit airplane flight or losing their voice after running an outreach event at a local airport. But what they have in common with this fictional insurance agent is that they compare rates to obtain the best rate and the broadest coverage on your aircraft insurance! To do this, AIR shops all the major aviation insurance markets. They work closely with aviation underwriters and know the ins and outs of owning or renting an aircraft because they are pilots themselves! As an example, AIR can save a pilot up to 50% on their aircraft insurance and 6% on renter’s insurance when compared to the only aviation insurance direct writer, Avemco. Do yourself a favor and start saving money on your aircraft insurance. An online quote request is just a click away. Or call 301-682-6200 to start talking to an aviation insurance specialist at AIR today. Baltimore, MD currently holds the record as the most active aircraft at the airport. The vintage Cessna 172 Skyhawk has since seen many “firsts” from solos, to check rides and flyouts. Pilots Dean Frail and Claudius Klimt designed the club to decrease the cost of flying and to increase the number of pilots at Essex Skypark. The emphasis is on competent flying. The one-time entry cost is only $600 with a $95/hour wet tach time. Members pay for 2.5 hrs per month, use it or loose it. 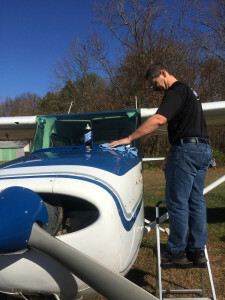 This non-profit club’s Cessna Skyhawk is managed by volunteers and maintained by a superb mechanic. Recently, the club was renamed to The Max Lichty Essex Flying Club in honor of Max Lichty, a 10,000-hour pilot and chief pilot at the flying club. The longtime resident of Essex Skypark was a passionate supporter of the flying club. Max lost his battle to cancer earlier this year and the members decided this was the best way to honor a great pilot and friend. As the list grows for the upgrades and repairs on their aircraft, so does the number of new private pilots the club has graduated. The plan is to continue for years to come. The Max Lichty Essex Flying Club thanks Aviation Insurance Resources (AIR) for its role in keeping flying affordable at Essex Skypark. AIR shopped all the aviation insurance markets to ensure this new club was receiving the best rates at the broadest possible coverage. To learn more about The Max Lichty Essex Flying Club visit: http://www.essexflyingclub.org/. Looking for an insurance quote for your flying club? Call 301-682-6200 to talk to one of our knowledgeable pilots and agents or request a quote online today! Despite the hurricane scare, DeLand Municipal Airport is going strong and ready to welcome pilots from all over to the annual DeLand Sport Aviation Showcase! From November 2nd through 4th, 2017 exhibitors and speakers will gather to offer a weekend of aviation education and fun. Since its inception, Aviation Insurance Resources (AIR) has had a presence at this sport aviation show. In fact, AIR was a factor in leading the aviation insurance industry to provide competitive policies for this relatively new class of aircraft. 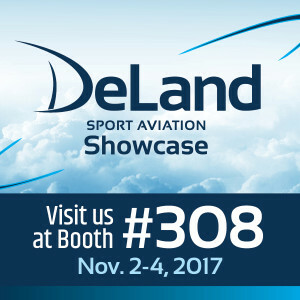 Agents and pilots Gregg Ellsworth, Joe Cacho, Joe Ruck, and Jon Harden will be available at booth number 308 to answer your questions on sport planes as well as other aviation insurance matters. “DeLand has always offered a special showcase. As a former trike pilot, I’m particularly interested in viewing the new trikes on the market today. From small weight shift aircraft to large jets, we insure all things aviation related. We look forward to these events to see how we can be of service to the aviation industry,” explained Jon Harden, president and founder of AIR. No matter your reason for attending, the Deland Sport Aviation Showcase promises to offer something for everybody. For more information on the showcase visit: http://www.sportaviationshowcase.com. Can’t wait for the showcase and want your aviation insurance questions answered today? Call AIR at 301-682-6200 or apply for a quote online today! Over a thousand hours of build time has gone into your aircraft. Many late nights out at the hangar and several seasons have passed, but the big day is finally here. Your pride and joy, your biggest accomplishment, is about to take its inaugural flight. Despite all your cross checks and due diligence, the nagging question is still in the back of your mind. Could something go wrong? Many pilots mistakenly believe that there are no options for insurance coverage during the fly-off stage and settle for sub-par 3rd party liability programs. These programs do not include hull coverage, are limited in their available defense, have low property damage limits, and outdated bodily injury terms. While these programs are often the only option for non-registered aircraft, real aviation markets offer the best coverage for the majority of homebuilt aircraft. From RVs to the Sonex, whether you’ve built a SeaRey or a Glasair, Aviation Insurance Resources (AIR) has your first flight solution. AIR works with all the aviation insurance markets, therefore, offering many options for insuring your first flight risk. Your AIR agent will go over with you the terms of each option for the fly-off stage of flight. A majority of these policies include hull coverage and industry standard liability limits. AIR also offers a builders and restorers insurance program, designed to protect the aircraft during the building or restoring stage regardless of pilot experience and qualifications. Customized with your needs in mind, this new insurance plan offers flexible liability and hull coverage options. Peace of mind is exactly what the agents and pilots provide at Aviation Insurance Resources. So, before you weld another joint or place another rivet, contact the pilots and agents at AIR! Call 877-247-7767 or submit a quote online today! 18 years ago, the aviation insurance industry looked quite different. Besides insurance direct writer, Avemco, only eight other companies offered aircraft insurance. To gain access to these companies, a pilot must go through an aviation insurance broker. Since the 90s, the aviation insurance industry has grown considerably. There are now 18 aircraft insurance carriers vying for a pilot’s business. Competition is fueling the rates and premiums are lower than ever, therefore benefiting the consumer. In 1999 a new aviation insurance broker came on the scene: Aviation Insurance Resources (AIR). Established by former Avemco employees, these pilots set out to create an aviation insurance brokerage that provided the best rates and the broadest coverage for their clients. This was a period of high premiums, strict training requirements, and transition pilots were near impossible to insure. However, AIR was appointed with all the aviation markets, offering their customers all the available options in the industry. Today, new aircraft insurance policies have been developed including the LSA class and Unmanned Aerial Vehicles (UAVs). Within the past decade insurance carriers have improved and enhanced their policies to maintain customer loyalty. Policies have since been written in a much broader language, training requirements are more lenient, higher liability limits are available, and transition pilots are easier to insure at the right price-point. AIR has been at the forefront of all these changes and passing along the savings to their insureds. Soon AIR will be celebrating their 20th anniversary. Many of their insureds have been with them since day one and many other pilots are constantly discovering the benefits of calling these aviation insurance specialists. The pilots and agents at AIR focus on integrity and place customer service as a priority above profit. To have an agent start shopping all the markets on your aviation insurance policy call AIR at 301-682-6200 today! Oshkosh, WI June 24, 2017 – Leading aircraft insurance broker, Aviation Insurance Resources (AIR), announced today the results of the 2nd annual “Get into the AIR” aviation scholarship. AIR received applications from pilots and student pilots from all walks of life, each with remarkable stories. Only one scholarship was slated for 2017, however, two very deserving individuals stood out prompting AIR to reward two scholarships this year. Fascinated by aircraft from the World War II era since an early age, student pilot Heather Geer plans to follow in the footsteps of her idols, the WASP (Women Airforce Service Pilots). 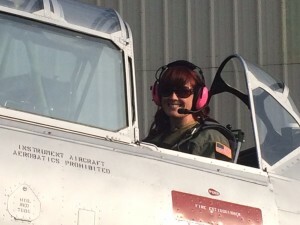 To reach her dream of becoming a warbird pilot, she plans to gain hours and experience by becoming a tailwheel instructor. Heather plans to complete her private pilot certificate by this October. In her spare time she can be found volunteering with the Bravo 369 Foundation, a non-profit focused on STEM education, aviation history and aircraft preservation. For the last decade, Chelsea Dorman could be found at the oldest continuously operating airport in the world, College Park Airport, guiding future young aviators on the history of aviation. As the College Park Airport Museum’s program coordinator, she has overseen many aviation centric events from lecture programs, to happy hours and community outreach. With the help of the Get into the AIR scholarship and saving her earnings as a figure skating coach in the winter, Chelsea will soon be on her way to becoming a pilot herself! Applicants were judged on essays and recommendations letters that best portrayed the pilot’s goals, drive, and commitment to the aviation industry. While competition was fierce, AIR could not be happier with rewarding these two dedicated individuals. The Get into the AIR aviation scholarship will be available again in 2018. Since 1999, AIR has remained closely connected to the industry they serve, many of their customers are friends and some are even family. This is because all of the agents at AIR are pilots and understand the needs and challenges in owning or renting an aircraft and aviation related businesses. No matter your involvement in aviation, AIR can provide a comprehensive yet economical solution for your needs. For updates on future scholarships or an aircraft insurance quote call 877-247-7767 or fill out a quote request online today! In partnership with Global Aerospace, leading aircraft insurance broker Aviation Insurance Resources (AIR) recently launched their online UAS/Drone insurance portal. With multiple liability options as well as hull coverage and worldwide territory, the Global Aerospace policy offers flexibility and options for the commercial drone operator. Always involved in the ever-changing aviation industry, AIR was one of the first aviation brokers to provide commercial drone insurance. All the agents at AIR are pilots and some are also Part 107 certified. Simply visit: https://www.air-pros.com/uav-form.php to submit your online quote or call 301-682-6200 to speak to an Unmanned Aerial Systems Insurance Specialist today! Aviation Insurance Resources (AIR) provides a full range of aircraft insurance and aviation insurance products to clients of all sizes. They represent all of the major aviation insurance markets so they can offer you the broadest package of protection at the best available rates. For more information visit: www.AIR-PROS.com or call 301-682-6200.